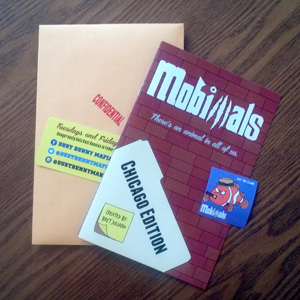 Mobimals (Mobster Animals) Have Arrived! What are mobimals you ask? Well, it’s pretty much what the name implies, mob animals. 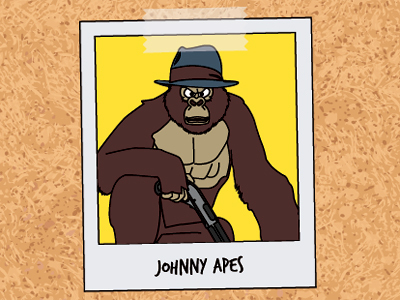 As an avid consumer of real-life mobster history, along my way, I’ve become fascinated at the amount of mobsters who have animal-related nicknames and I was thinking how cool would it be to one day create a bunch of animal mobsters based on real-life mobsters. But you’ve already got mob animals in your comic! Indeed, but there’s a big difference between these mob animals and the ones I’m illustrating in my comic, these animals are all based on historical mobsters (both living and deceased). Secondly, these mob animals aren’t limited to the scale of the Dust Bunny Mafia world…ie, there are mob animals illustrated in a large variety of sizes, from ants to horses! 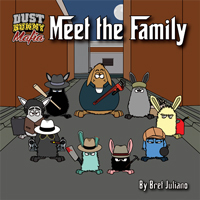 The interesting thing that you’ll find in these collections is that included with each mob animal is a bit of trivia about the real-life mobster that they are based on. 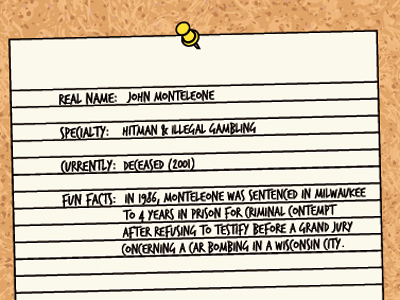 Pictured above is Johnny “Apes” Monteleone, and below you’ll find some of the most interesting information I was able to compile about him. Some of the high points are: real name, specialty, current status (living, dead, witness protection, etc. ), and some fun facts. Each edition of Mobimals will have a unifying factor, right now, they are grouped based on location. Considering that I’m living in Chicago now, I thought that creating the first edition should be based around the notorious Outfit, Chicago’s own mobster family.